Dine in Esquire Kitchen 大人餐厅 and order your Dongzhi Tong Yuen at RM1*! 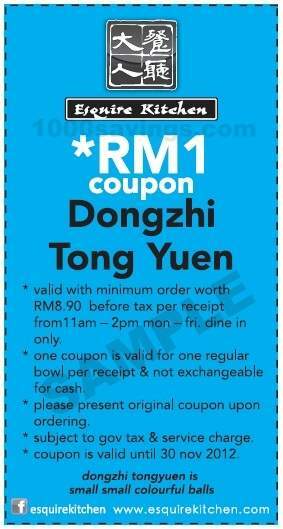 Present the original Esquire Kitchen RM1 Dongzhi Tong Yuen coupon (cut it out from today's The Sun newspaper - 5 Nov 2012, page 12) to enjoy one regular bowl of Dongzhi Tong Yuen (small small colourful balls) at RM1*. * valid with minimum order worth RM8.90 before tax per receipt from 11am - 2pm (Monday - Friday). Terms & conditions apply. Esquire Kitchen is available at Sg. Wang Plaza, Damansara Jaya, IOI Mall, Leisure Mall, OUG Plaza, Pandan Kapital, The Mines, Mid Valley Megamall, Subang Parade, Endah Parade, Tesco Puchong, One Utama, Sunway Pyramid & Tropicana Mall.